Welcome back, Arrowheads! 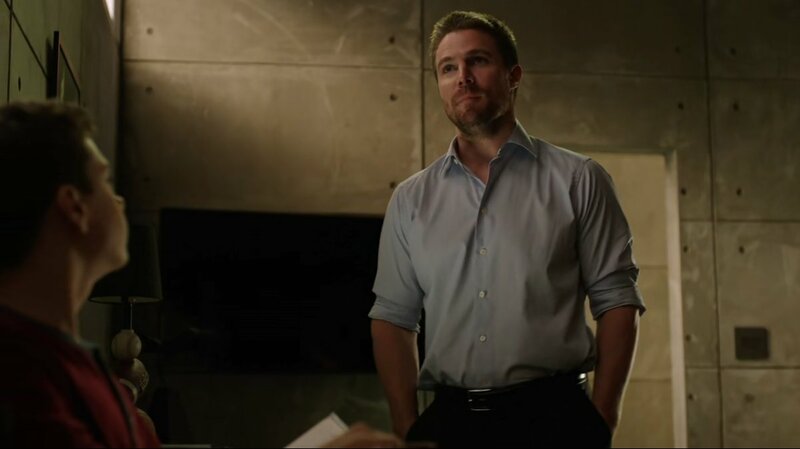 Oliver Queen has always had a lot of his plate for the last five years: pretending to be a normal rich boy while also secretly waging war against crime in Star City. But now that he’s had to also raise a son, he’s had to reassess his priorities. So he enlists his buddy John Diggle to take over the mantle of Green Arrow! And that would be a great idea, except Diggle has not revealed to Ollie the nerve damage that is currently impeding him. So, what to do? A New Green Arrow In Town. Remember that Faust guy from a few episodes back? 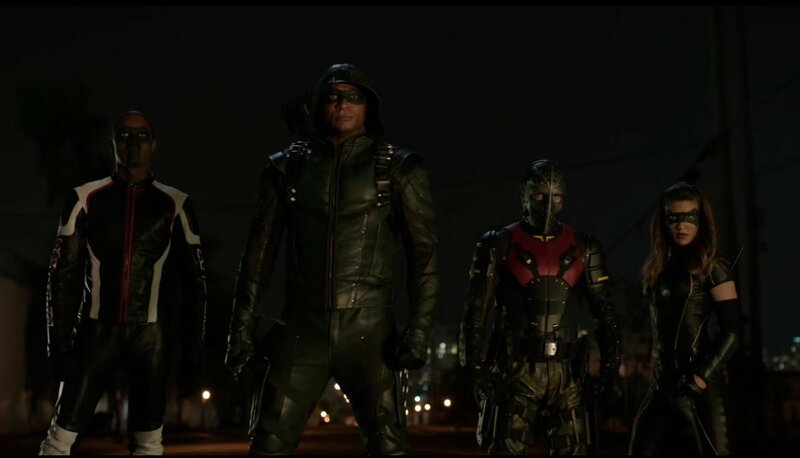 Well, he gets caught by Team Arrow, lead by a new Green Arrow, Diggle! Seems like a great night for the new Green Arrow, except that weird thing of him not shooting arrows like the Green Arrow usually does, a fact not lost on anyone, even Agent Watson. Meantime, Ollie is busy trying to be a more helpful father to William, even though Ollie is not exactly the help you ask for when it comes to math tests, which William really needs help on. That night, at a Kord Industries building, some lady breaks into a server room full of people, drops some weird flash bang grenade, and then all the workers are just dead. Man, Kord Industries has just the worst security EVER. Periods of Adjustment. Dinah and the cops arrive at the crime scene, and from there, she puts in a little bug for Felicity and Curtis to find out what information was stolen from the server. At the mayor’s office, Quentin learns there’s an anti-vigilante bill about to argued in the city council, and thinks Ollie getting behind it might improve things with the SCPD. Yeah, even he’s not convinced he can pull the teeth out of that legislation. But, Ollie has other concerns, like how to handle his kid’s irritation over that math test, which he shares with Felicity. NEW TEAM ARROW DYNAMIC POSE!!! There’s a lead made on that info stolen from the server, in that what was stolen was transportation info on some rather nasty nerve gas. The Team finds the truck transporting the nerve gas, and end up being ambushed by our mystery woman, who has those flashbang grenades and hey, some extra people who aren’t as affected by them. The woman kills the security force in the truck, knocks out the Team, moves the nerve gas containers to a van, and sets the truck off. The Team is asking their new boss what to do, and Diggle freezes. It may not have mattered anyway that Rene goes after the truck, because the woman bails out as the truck hits an apartment complex and explodes. Wants and Needs. The Team arrives with the only good news out of this being no one is dead (although critical condition for a few of them isn’t exactly good). Well that, and Felicity has found out the mystery woman is some black ops agent called Onyx, who went missing a few years ago after stealing 100 million in Syrian gold. As we learn later, Onyx’s team from that robbery is missing a few people, people who were likely murdered by Onyx, but still leaving one person not accounted for. Rene is clearly irritated by Diggle freezing up like he did, but Dinah tries to hold the line by explaining it away as just a “fog of war” thing. Diggle clearly appreciates her support, even though she’s not content in Diggle not telling Ollie about the nerves. Ollie is having trouble because Team Arrow’s screw up is forcing a vote to made sooner than later on that anti-vigilante bill. And after a talk with William about what he needs for help on that math test, he asks Felicity if she can help tutor him. As if that wasn’t enough, Rene visits Ollie saying that Diggle is dropping the ball at this whole leadership thing and the Team needs him back. Questioning Authority. Ollie visits the HQ and after asking Felicity for help on the math tutor thing, sees Diggle and asks what’s wrong. Diggle admits he’s not sure how to lead the Team (mind you, he doesn’t bring up the nerve damage), but Ollie reassured him that he’s only where he is because of a friend like Diggle to point him in the right direction. That speech won’t help with physical injury, but okay. Somewhere else, Onyx is talking to her team about starting the mission to kill the only other defecting member of her squad. Time for another episode with Oliver Queen…helping with math problems? Man, this season is taking a weird turn. Later that night, Felicity is busy helping William out with his math problems, and while that is happening, Ollie seems to be surprised how well things are going. But Felicity is called away because they got a bead on the remaining team member, Reynolds, and he is at a hotel. So Onyx plans to kill Reynolds by releasing nerve gas into a hotel? Kind of like blowing up a house to kill a cockroach, but no one ever said bad guys were sane. Hotel Emergency. The Team arrives at the hotel, equipped with some special visors to block out the flash bangs Onyx has. They run into Onyx’s team and Reynolds, and are forced into a big decision once Onyx decides to set off a vial of the nerve gas in the hotel lobby. Do they save Reynolds or stop the gas? Diggle decides to to both, letting him and Rene grab Reynolds and stop Onyx, while Dinah and Curtis deal with the gas. The latter gets handled pretty nicely by just putting it into one place and blowing it up, and on the former end, Onyx and Reynolds are both caught. How Diggle Got His Groove Back. The Team comes back to the HQ victorious, and with a surprise: Felicity presents Diggle with a swanky new crossbow! Even more surprising, he’s able to use it with his nerve problems! Let’s not ask how that is possible right now, but focus on Ollie deciding to deal with the anti-vigilante bill in his own way. Instead of delaying the vote, he forces the bill to be voted on by the citizens of Star City! Also, Watson is convinced John Diggle might be possibly linked to the Green Arrow. Like the undead, Olicity is back! –Comic book connections: Onyx in the comics was actually a vigilante herself, and had links to the League of Assassins. –One name for Felicity and Curtis’ start-up: Bit by Bit. –I feel bad for that poor truck crew driving that nerve gas around getting killed. Not so much for their music choices, though. –I can’t imagine lighting nerve gas on fire in a hotel lobby would be less destructive than what I just saw. –Hey, someone mentions Thea could be a great aunt for William. She’s still in a coma, in case you were wondering. ← DC TV Recap Round-Up, Issue 2: Adjustment Periods!